Distinctive Cabinetry; What's the Right Kitchen Countertop for My Home? 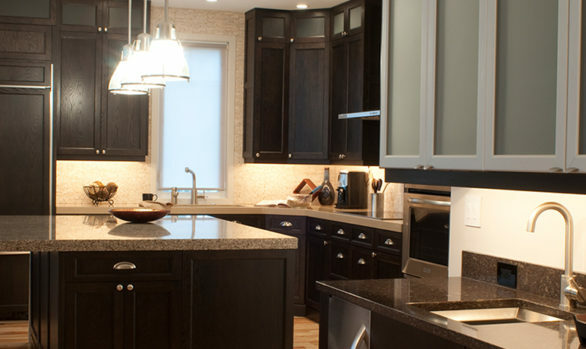 Home Granite Countertops What’s the Right Kitchen Countertop for My Home? 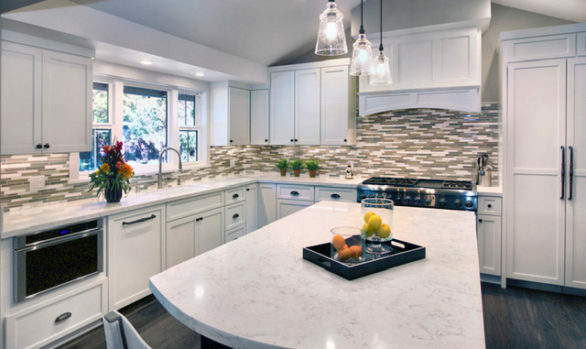 Whether remodeling a kitchen or building a new home, few home owners’ material choices will have as lasting an impact as the choice of cabinets and countertop materials. Although this post focuses on kitchen countertop materials, you can find our Best Options for Kitchen Cabinets here! The materials chosen will affect the overall look of the kitchen, the way you use the kitchen, and the value of the home at the time you sell it. 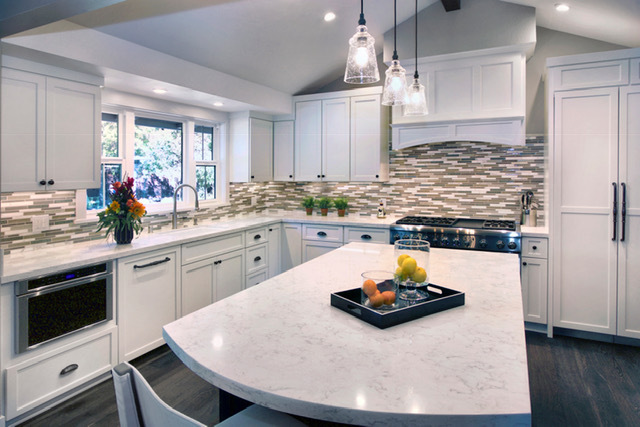 With these factors at stake, a homeowner would be well-advised to consider all the options before choosing their kitchen countertop material. Remember, there is no right or wrong choice. 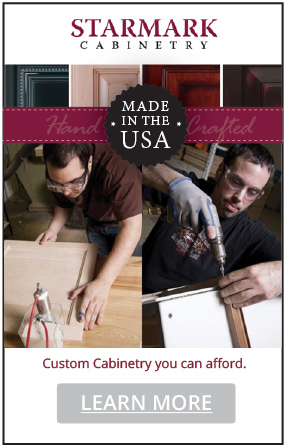 Cabinets & countertops are a very subjective and personal choice. Although, the important first step is to do the research, then weigh the perks and disadvantages of each kitchen countertop material. So without further ado, let’s get started! 1) LAMINATE: One of the most affordable of kitchen countertop materials, laminate surfaces come in a variety of colors and patterns. Some patterns even imitate the look of wood or stone products. Although the price of laminate surfaces makes them very popular, laminate surfaces are nonresistant to heat and scratches and lack the durability of some of the more expensive products. 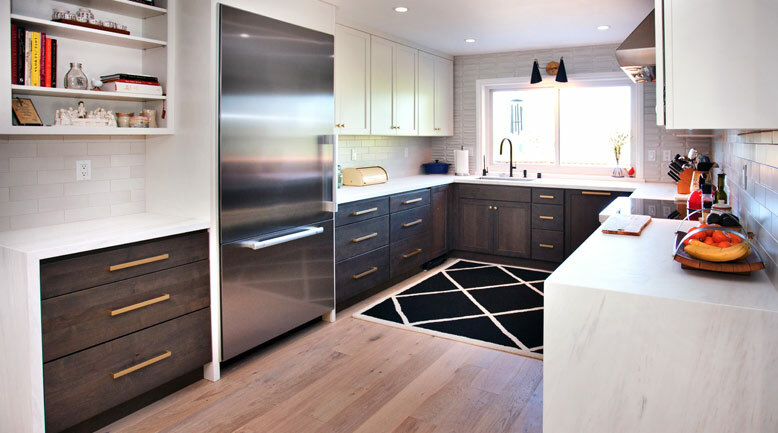 The cost of laminate surfaces begins as low as $8 per linear foot, but its short lifespan keeps it from always being the most cost effective countertop choice. Remember the old saying “Buy Cheap, Buy Twice”. 2) TILE: Another reasonably priced countertop material is tile. Tile comes in a myriad of colors, textures and sizes to allow the home owner to really customize the look of his kitchen. Costs begin at $5 per square foot, but can go up quickly depending upon the type of tile used. 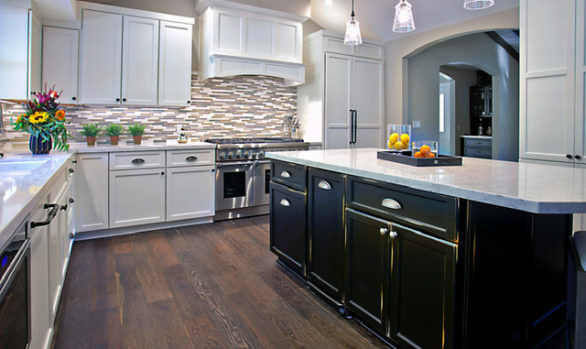 Unlike the laminate surfaces, tile countertops are extremely resistant to heat and scratches. The main drawback of tile surfaces is the maintenance required for the grout lines. Grout can become stained or damaged and sometimes require bleaching or even replacement. 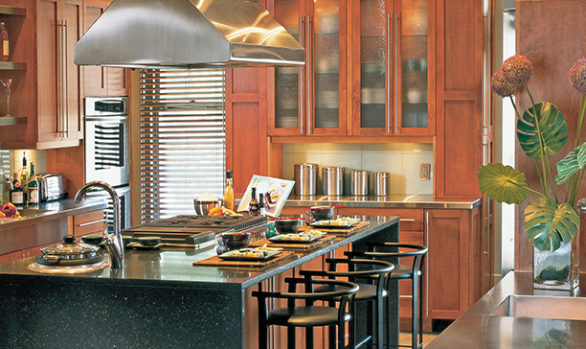 1) WOODEN: There are also several more expensive options to complete your kitchen look. One of the costlier countertop materials available to homeowners are wooden countertops. Most wooden countertops are comprised of smaller strips of wood pieced together to form a material called butcher block. These wooden countertops require regular applications of sealant. Although wooden countertops are susceptible to heat marks and scratches, they can be repaired by sanding out the damaged areas. The cost of wooden countertops, average around $50 per linear foot. That is much closer to high end countertop materials without having all the characteristics of the high end materials. 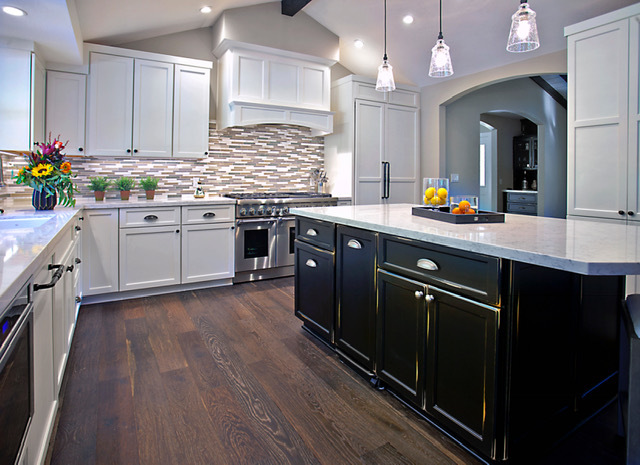 1) SOLID SURFACING: One of these high end countertop materials is called solid surfacing. Solid surface countertops are made of a plastic resin that can imitate the look of natural stone, without the maintenance requirements of stone. 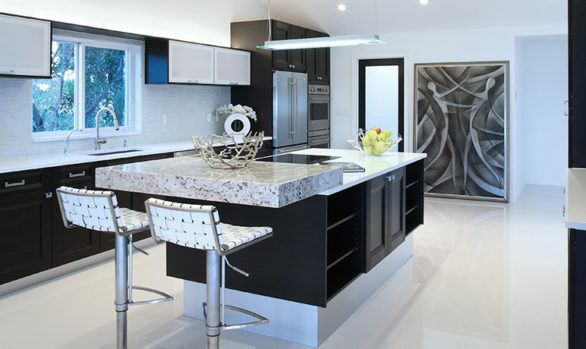 Solid surface materials are more expensive, ranging from $50 to $80 per square foot, but bring a lot of advantageous characteristics into the home owner’s kitchen. Solid surface materials are nonporous and resistant to burns. They are softer than stone, but scratches are easily sanded and buffed out. Solid surface countertops also come in a rainbow of colors or patterns. 2) ENGINEERED STONE: A hybrid between solid surface countertops and natural stone countertops is the engineered stone product. 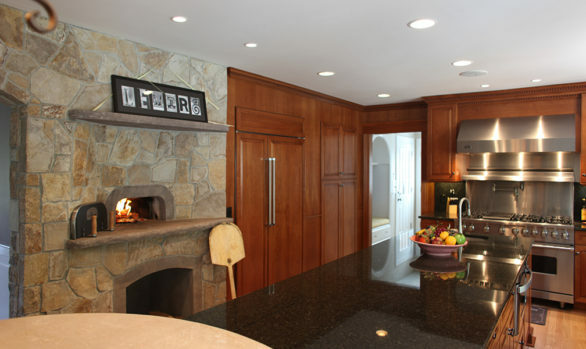 Engineered stone mixes crushed quartz with the resins of solid surface products to imitate the look of granite. Because the resins are available in such a wide range of colors, engineered stone countertops are also available in patterns that wouldn’t be found in natural stone. Engineered stone doesn’t need the periodic sealing that natural stone requires and resists scratches, burns and stains. 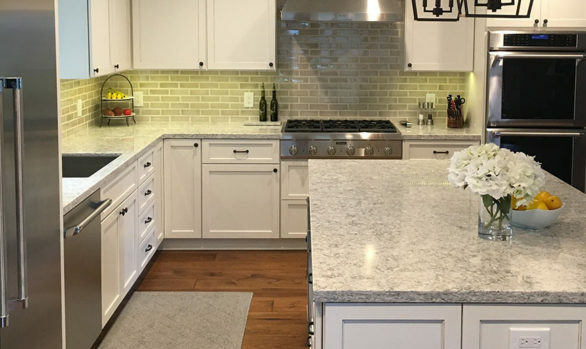 With prices averaging between $60 and $90 per square foot, engineered stone products are a nice alternative to solid surface or natural stone products. 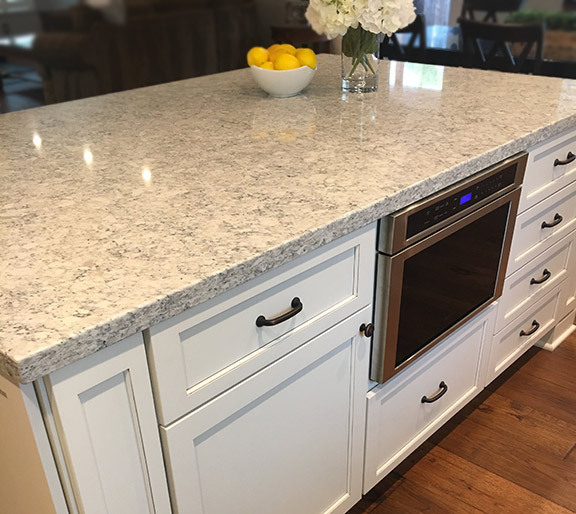 3) GRANITE OR MARBLE: Even with all of the man-made options available to home owners, no product exemplifies a luxury kitchen like natural stones like granite or marble. Natural stone isn’t affected by heat and with regular sealing is resistant to stains. Natural stone is available is many different color and patterns, but must be hand selected, as each sheet of stone is different. One prohibitive characteristic of natural stone is its price between $60 and $100 per square foot. Coupled with the maintenance required, natural stone’s price point brings it into sharp relief with its engineered cousin. 4) CONCRETE: Finally, some home owners wish to make a statement with the look of their kitchens. 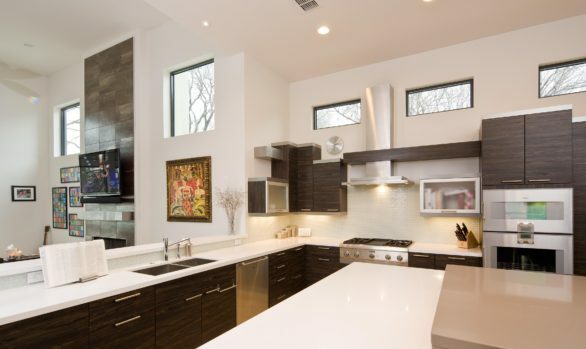 Some alternative, more contemporary countertops options allow these home owners to create an edgy or urban look in their space. 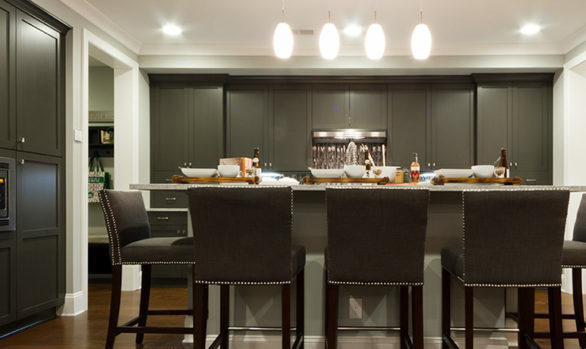 Concrete countertops are extremely popular in industrial styled spaces. Stains can be applied to the concrete to bring different colors into the countertop and different application methods allow for a great deal of customization. Concrete countertops do have to be sealed regularly to avoid stains, however, and can scratch and crack over time. Concrete’s pricing is comparable to the stone and solid surface products’ pricing, making concrete an aesthetic choice, rather than an economical one. 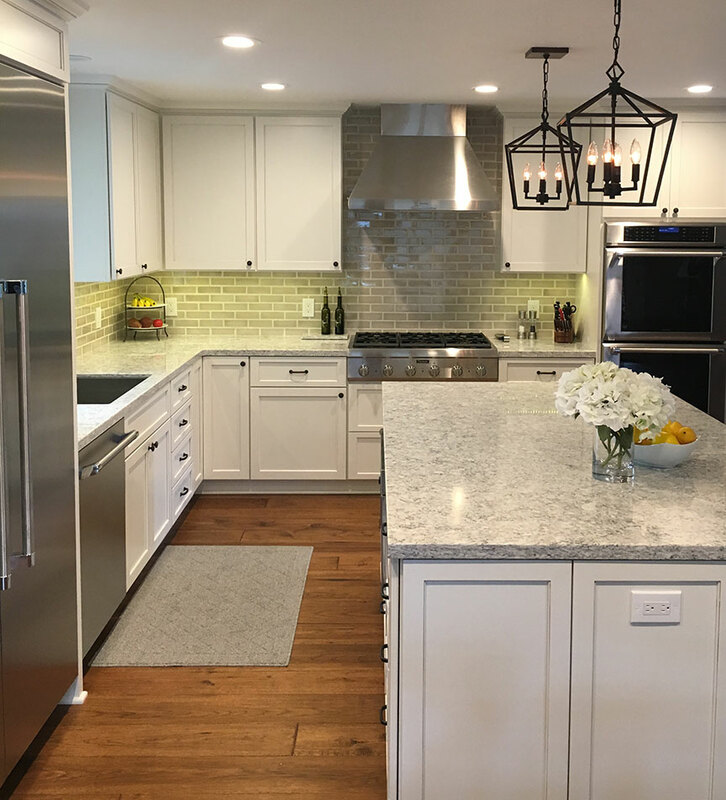 1) STAINLESS STEEL: Stainless steel countertops can sometimes be seen in a commercial setting or in kitchens designed to feel like commercial kitchens. Fingerprints and scratches are concerns for stainless countertops, as they show in the reflective surface. Although stainless countertops can be dented, they are very resistant to heat, water and staining. As with concrete, stainless steel countertops costs are similar to the costs of stone or solid surface. 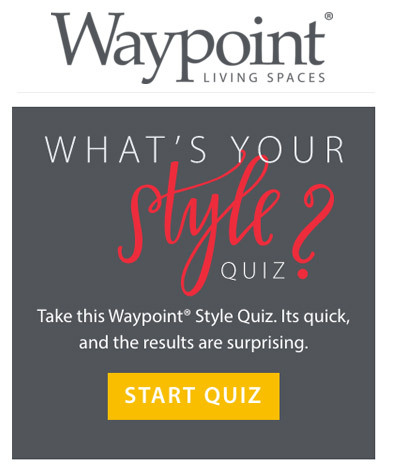 By explaining the differing types of kitchen countertop materials, we hope your selection process has become a bit easier. 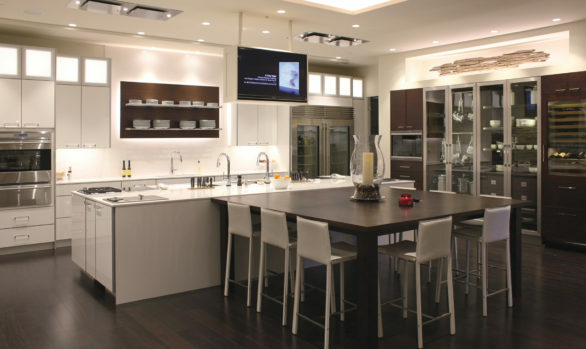 Furthermore, if you’d like to view samples or discuss countertop options further, our Walnut Creek Showroom is stocked full of cabinet & kitchen countertop styles. 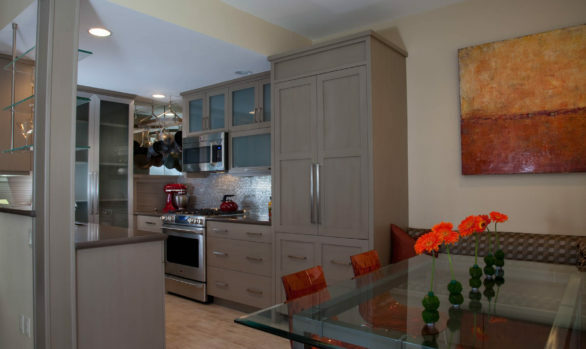 Distinctive Cabinetry has helped thousands of clients in the East Bay Area with their kitchen renovations. We welcome you make an appointment for a complimentary 30-minute “IN-STORE” Consultation.